Uterosacral ligament vaginal vault suspension is an elegant reconstructive procedure for apical prolapse which restores the natural vaginal axis using solely native tissue supports. It is suited to women with moderate apical prolapse in which the uterosacral ligaments are likely to be preserved. It can be employed in combination with hysterectomy or in the case of moderate post-hysterectomy vault prolapse. Important points are highlighted, including avoidance of nerve and ureteric injury (see also Chapter 1). Uterosacral ligament suspension can be performed concurrent with other repairs and is one of several options for addressing apical prolapse. 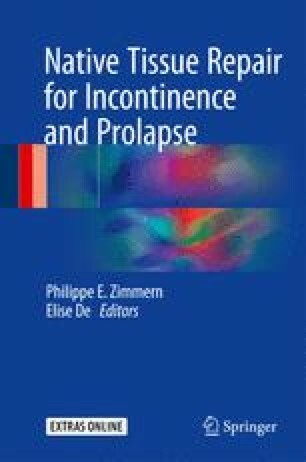 In the event that the uterosacral ligaments are unsatisfactory, the surgeon should be prepared to offer alternative repairs to address apical prolapse (see also Chapters 8, 10, 11 and 14). The online version of this chapter (doi: 10.1007/978-3-319-45268-5_9) contains supplementary material, which is available to authorized users. The authors declare that they have no conflicts of interest in relation to the content of the manuscript.